Oh how I love to make layered Christmas cards (I do love Clean & Simple cards too, but there is just something magical about a traditional die cut card). 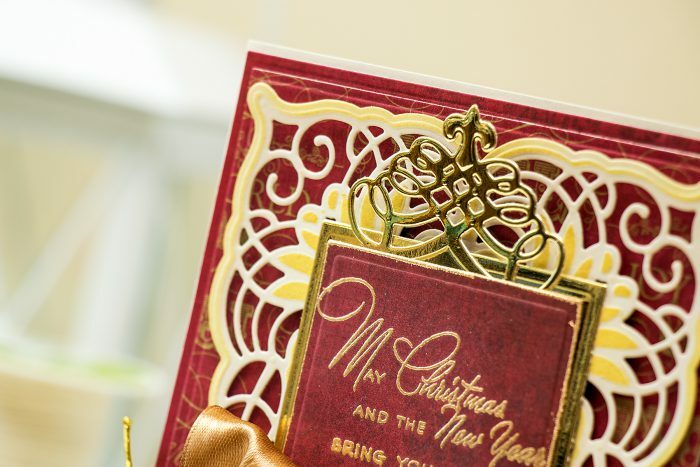 Today I’d like to share classic Holiday Card using dies from Amazing Paper Grace collection from Spellbinders. 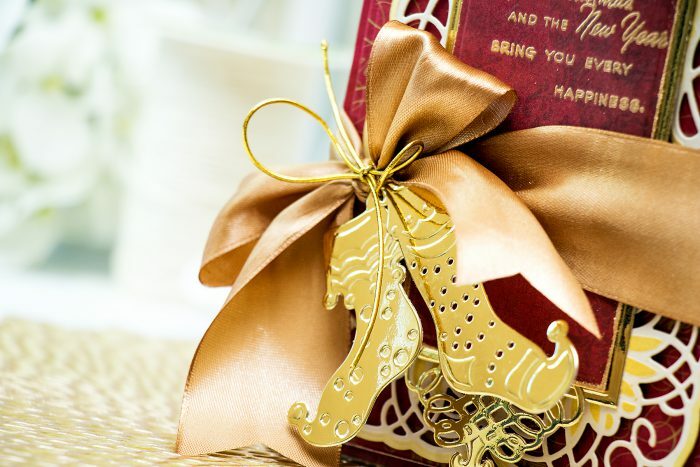 To create this card I not only die cut and embossed the main element from the Cascading Grace die set, but also stenciled gold ink through the die to add additional detail to my die cut. I rarely do this, but this is something you can always do with Spellbinders dies and it really adds a lot to the finished project. Aside from using Cascading Grace dies, I also used fun Stocking Trio set – I die cut two stockings out of gold mirror cardstock (couldn’t resist using it for a holiday card) and also 5×7 Matting Basics A and B dies – those are my go to dies when I’m making layered cards with lots of panels. I added a large ribbon bow to this card, something I picked up from Becca Feeken, I love her use of ribbon on cards. 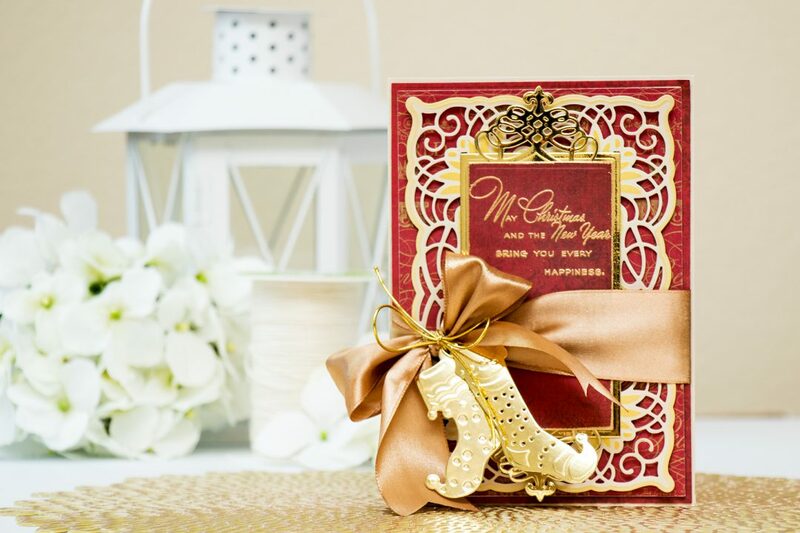 The sentiment came from a Stampendous stamp set, I heat embossed it in gold embossing powder and also embossed the edges of my panel to make it look like it was dipped in gold paint. Such an elegant card. Love it. Outstanding as usual! Where is the greeting stamp from? It says it all! I just love your card, it is so stunning! Since finding your work I have followed you on you tube with total admiration so thought it time to leave a comment here on your blog because I adore your creativity. Today’s cards is so elegant and although a modern styling it is very traditional and a hark back to more elegant days. So beautifully done. This is a beautiful card – truly a work of art! Thanks so much for sharing and for the video! Very intricate and beautiful card! This card is so gorgeous! !